The Mulva Family Fitness & Sports Center (formerly the Schuldes Sports Center) has undergone a $26 million expansion and renovation. 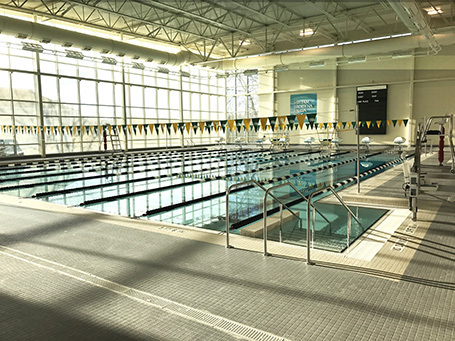 Home of St. Norbert’s basketball and volleyball teams, the expanded Mulva Family Fitness & Sports Center is also home to the new swim and dive teams, which were added as official varsity sports with the completion of this project. The refurbished and enlarged facility features a state-of-the-art fitness center and a new swimming pool on the east side of the sports center which looks out to the Fox River. Counsilman-Hunsaker was the lead aquatics designer for the competition pool at the Paul O. & Carol H. Gehl Aquatic Center located at the Mulva Family Fitness and Sports Center. The 4,500 sq. ft. pool features an eight lane, 25-yard pool which features two 1-meter diving boards and mezzanine area for spectator seating. Boasting 130,000 sq. ft. of space, the building also includes new administrative offices for the athletics staff, health and wellness services, and the addition of a second floor. The arena provides a 116 ft. by 230 ft. multipurpose area with a seating capacity of 2,500 for major sporting events and up to 5,000 for other high-attendance programs. The arena offers a full collegiate basketball court, an indoor track, four volleyball courts and four intramural basketball courts.